In a landslide victory with enough coattails to keep a Democratic fabric manufacturer in business another four years, Bill de Blasio was elected as the city’s 109th Mayor and will officially take office in January. The victory, by nearly 50 percentage points, was also a win for progressive politics as de Blasio is a liberal Democrat and the first from the party to run City Hall after 20 years of Rudy Giuliani and Michael Bloomberg. The election also highlighted Brooklyn’s growing clout in the city and particularly Central Brooklyn replacing Harlem as the city’s most powerful political center for African-American politics. 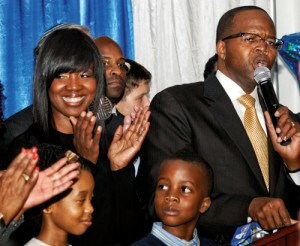 Among those candidates from Central Brooklyn that also swept to landslide victories were Fort Greene City Councilwoman Letitia James, who in being elected Public Advocate, became the city’s first black woman ever elected to a citywide public office. James, also an accomplished attorney, said she will use the office to fight for those with little voices. “I would love to have an army of attorneys making sure that people have access to programs, looking at social justice cases and impact cases, and pattern and practice cases, and really making sure that government is transparent,” she said. Meanwhile, Ken Thompson, 47, trounced 23-year incumbent Charles Hynes with nearly 75% of the vote to become the borough’s first black District Attorney. Thompson’s win comes two months after he defeated Hynes in the Democratic Primary, and after Hynes decided to run as a Republican in a race that turned ugly with accusations. “I ran for Brooklyn DA because I heard about a woman named Shirley Chisholm who ran for president as a black woman and who paved the way for future generations of elected officials of color here in Brooklyn,” Thompson said in his victory speech. “There are a lot of serious issues in that office, and we have to get to them as soon as possible. Like, if there are any innocent people in prison for murders that they didn’t commit, we have an obligation to get them out as soon as possible,” he added. Also cruising to victory was Flatbush State Senator and former New York City policeman Eric Adams, who will become the borough’s first black Borough President. Central Brooklyn also elected several new City Council members including Laurie Cumbo in Fort Greene/Clinton Hill and Robert Cornegy in Bedford-Stuyvesant.